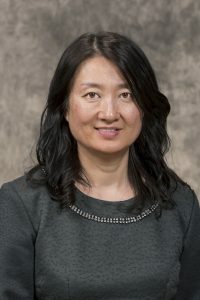 Jie Chen, assistant professor of nursing, recently received a grant through the Joan E. Wood Award for Nursing Faculty Research. The research project will involve comparing three patient transfer devices and the amount of physical stress that caregivers experience as a result of handling those devices. It will also examine differences in the head impact of bedridden patients during a lateral transfer between a bed and a stretcher. Caregivers in nursing environments are at a high risk of sustaining occupational injuries related to overexertion. Also, high head impacts during a lateral transfer can be very painful for patients of an advanced age. Through this research, Dr. Chen hopes to provide the medical world with valuable data that will hopefully result in a decrease in both phenomena. Congratulations, Dr. Chen!